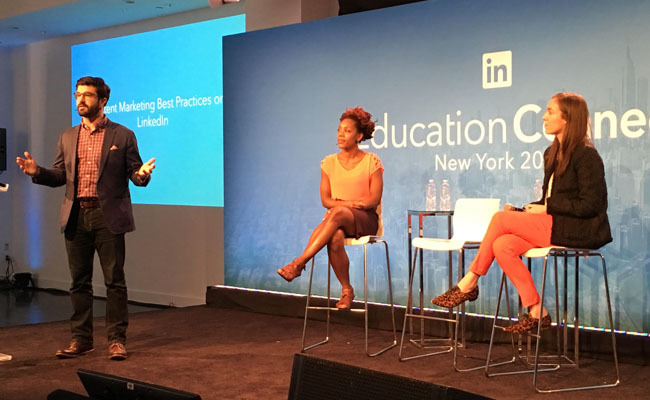 LinkedIn’s Education Connect 2015, an event that examined the future of education and education marketing, took place this week in New York. The event featured speakers such as Ted Mitchell, Under Secretary of Education, U.S. Department of Education; Zoe Baird, CEO-President of Markle Foundation, and a host of leading education marketers, such as Andrew Hickey of eCornell and Christa Watson from Pearson. If you don’t do it, a coding bootcamp will do it.” – Zoe Baird, CEO-President, Markle Foundation, on how colleges are facing competition when it comes to teaching necessary business skills. “You can earn revenue across the lifetime of your student, not just until they turn 22.” – Baird on how college education is stretching far beyond the traditional 18- to 22-year-old students. “The decision process is exclusive, and it’s critical to the make it to the short list.” – Christina Jenkins, Director of Global Research, GSO Insights, LinkedIn, on how the higher education decision-making process is long, but it comes down to a few finalists early in the process. “You need to have thumb-stoppingly good content.” – Lombardo on the value of strong mobile content. “Buy Apple stock.” – Hickey, when asked what advice he would give his freshman self. “We want to be known when we turn out the lights as an administration that fought for the most vulnerable students in pre-K and in K-12 and in higher education. We want to be known for creating real opportunities to help students reach their dreams. A real democracy is not organized by zip code, not by race, and not by your tax form. It is organization by heart, aspiration, and talent.” – Mitchell, after being asked what he hoped his department's legacy would be. Singular, a mobile marketing analytics platform, has named Patrick Mork as the company’s CMO. He was most recently global marketing director of Google Play and was previously a marketing executive at GetJar and Glu. For more information on how students have changed and insight into how marketers can reach then, download the new eBook from LinkedIn, Connecting with Today’s Prospective Students: How Higher Education Decisions are Made in the Digital Age.